In the Project browser, double-click a video clip, or select more than one video clip or a frame range and then double-click. 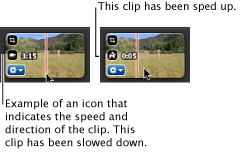 In the Clip inspector that opens, drag the Speed slider to the left to make the video play slower or to the right to make it play faster. The farther you drag the slider, the more extreme the speed change. To set the percentage of the clip’s normal speed you want to apply, or to set the clip’s duration in seconds, type values in the fields to the right of the Speed slider. If you see a Convert Entire Clip button instead of the Speed slider, click it. Certain types of video—including video shot with the iPhone and H.264 video shot on the Flip camcorder—must be converted before making a speed change. After the video is converted, you can drag the Speed slider or set the percentage of the clip’s normal speed as described above. If you change your mind later and want to undo the changes you’ve made, you can always open the inspector again and reset the speed or direction of the clip. Click Done when you’re finished. In the Project browser, select one or more video clips or a frame range. To slow down the selected video, choose Clip > Slow Motion, and then choose a percentage to slow the clip: 50%, 25%, or 10%. To speed up the selected video, choose Clip > Fast Forward, and then choose a multiple: 2x, 4x, 8x, or 20x. If an option can’t be selected, it means the video clip isn’t long enough to accommodate that increase of speed. Or, it may mean you need to convert your video. Certain types of video—including video shot with the iPhone and H.264 video shot on the Flip camcorder—must be converted before making a speed change. Double-click the clip in the Project browser. In the inspector that opens, if you see a Convert Entire Clip button, click it. Then choose Clip > Slow Motion or Clip > Fast Forward again. If you change your mind later and want to undo the changes you’ve made, double-click a video clip, or select one or more video clips or a frame range you want to restore. In the inspector that opens, move the Speed slider to reset the speed of the clip, and then click Done. Rabbit facing to the right: The clip is sped up. Turtle facing to the right: The clip is slowed down. Rabbit facing to the left: The clip is reversed, or both sped up and reversed. Turtle facing to the left: The clip is reversed and slowed down.